Barbeque Nation head chef Vijay Anand Bakshi lifts the lid on grilling the perfect cut of meat. 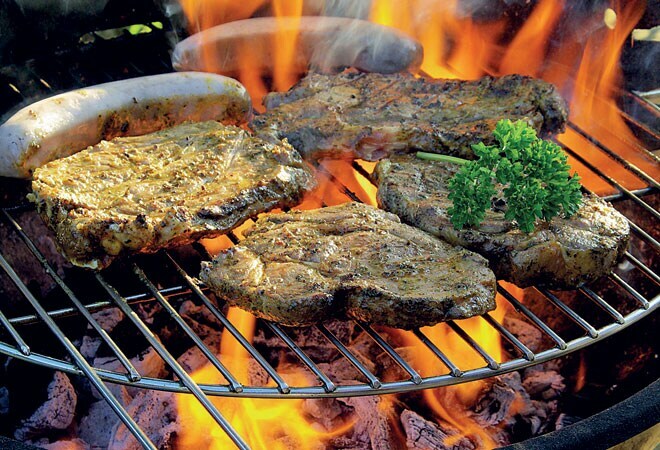 While the sight of sizzling meat on an open grill is tempting, it is wiser to invest in a gas or kettle grill. Open grilling is subject to the vagaries of weather, and requires time and devoted attention. Moreover, it is possible to replicate the smoky effect of open grilling with a few adjustments to a gas or kettle grill. Gas grills offer more control in terms of temperature, texture and flavour. A kettle grill with a well-fitting lid and a thick steel bowl is the best option for whole poultry and big cuts of meat. Charcoal is your best bet for imparting a smoky flavour to the meat. Halfway, the juices from the meat drips on to the charcoal, releasing sudden flares and imparting that heady smokiness to the meat. As wood smokes slower than charcoal, it works better for open grills and ovens. When using a gas grill, place the meat on a thin wooden plank soaked in water to impart smokiness. Don't leave out the marinade when grilling meat. Choose herbs based on personal preference and some tenderising element, but keep away from sweet sauces. Rub it into the meat evenly an hour before grilling and wipe off the excess. Be generous with the seasoning, but don't go overboard with the salt. Depth of flavour allows for pork, beef and venison to be glazed with a wide variety of sauces. You might need to be more careful with basting ingredients when marinating joints of chicken. Chicken, fish and vegetables are better grilled at a lower temperature. Fish and chicken, which take less than half an hour to cook, can be grilled directly over the coals. Racks of ribs and whole turkeys should be treated to the method of indirect grilling. This method employs a technique similar to that of baking, and the insides of the meat get cooked completely.